I fell in love with this delicious combination on a trip to Bergamo, the hilltop city in Lombardy, just north of Milan. I was with my father on my first visit to Italy in 1974, and one night we stumbled into a small little trattoria after driving a considerable way south from Switzerland and we just couldn’t keep going on to Milan without dinner. I had squash ravioli with a meaty sage-spiked creamy veal sauce that night as a pasta course. And the combination of flavors, an Italian classic, began to sneak its way into Italian restaurants in the late 70s in New York. I remember a squash and veal risotto at La Colonna in the early 1980s that blew my mind, and by the late 80s I saw plenty of dishes pairing noodles, veal and squash. I love this one above all. Low on tomato, just enough for acidic balance, I can’t imagine this won’t become an instant favorite for you. In a large enameled cast-iron casserole, cook the bacon in the oil over moderate heat, stirring occasionally, until the bacon is crisp, about 5 minutes. Add the carrot, celery, onion, garlic and a generous pinch of salt and cook over moderate heat, stirring occasionally, until just starting to brown, about 5 minutes. Add the ground veal, sage, parsley, bay leaf, oregano and basil and cook, breaking up the meat with a wooden spoon, until no pink remains, about 8 minutes. Add the wine to the casserole and cook, stirring, until nearly evaporated, about 3 minutes. Add the tomatoes with their juices and cook, stirring, until the liquid has reduced by half, about 4 minutes. Add the stock and bring to a simmer. Cook over moderately low heat, stirring occasionally, until slightly reduced, about 8 minutes. Stir in the squash and simmer, stirring occasionally, until the squash is tender, about 25 minutes. Discard the sage, parsley and bay leaf. Stir in the heavy cream and season the sauce with salt and white pepper; keep warm over very low heat. In a large pot of salted boiling water, cook the pasta until al dente. Drain well and transfer the pasta to deep bowls. Spoon the sauce over the pasta, garnish with thyme and serve. 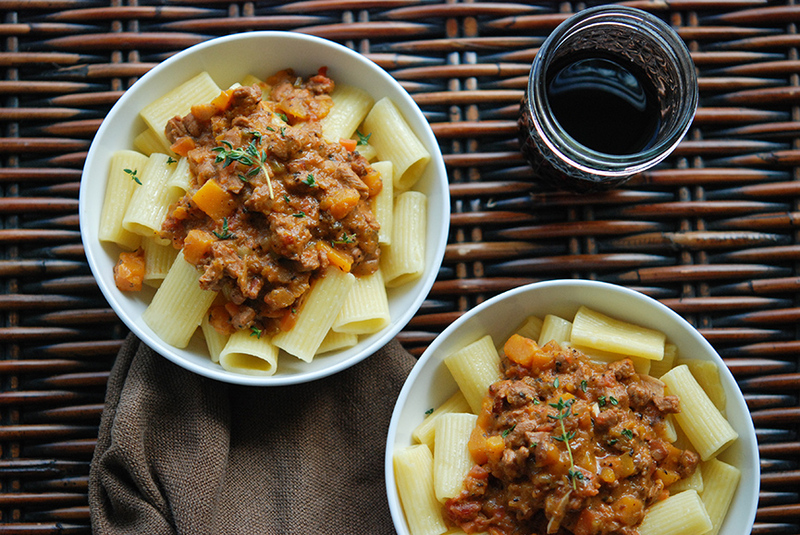 MAKE AHEAD The Bolognese sauce can be refrigerated for up to 2 days. Reheat gently before serving.